NZ’s biggest volume grade 5 rapids! Grade 2 to 5, you choose! Your chance to navigate 10kms of one of NZ’s most beautiful rivers, our exhilarating grade 5 adventure will get your heart pounding. Starting off on the calmer upper stretches of the Rangitata river, you’ll have plenty of time to perfect your paddling skills and warm up through the grade 2 & 3 rapids before arriving at the grade 5 section of the Rangitata Gorge. At this point you can choose if you want to continue rafting through the thunderous rapids, tight gaps and rocky outcrops of the Gorge itself or would rather walk around and admire them from the side. To cool off after all the action, there’ll be a chance to go for a surf and take a dip in the calmer sections. Scroll down for a full run-down of the day. Along with your guide who will be in the boat with you, our photographer will be on the river bank catching all the action on camera and a safety kayaker will paddle alongside you on every trip. For more information, check out our FAQs or see some photos. Feeling nervous? If some bits are too much you can walk around them with our photographer. Meeting at our base in the shadows of the Southern Alps, we’ll get you wet-suited and booted before driving through breathtaking scenery to our starting point – the top of Rangitata Gorge. We wouldn’t drop you in the deep end without the key skills. So we’ll kick off our adventure on (mostly) flat water, teaching you the paddling and safety skills needed to tackle the river. When you’ve got the hang of things, the fun really begins. 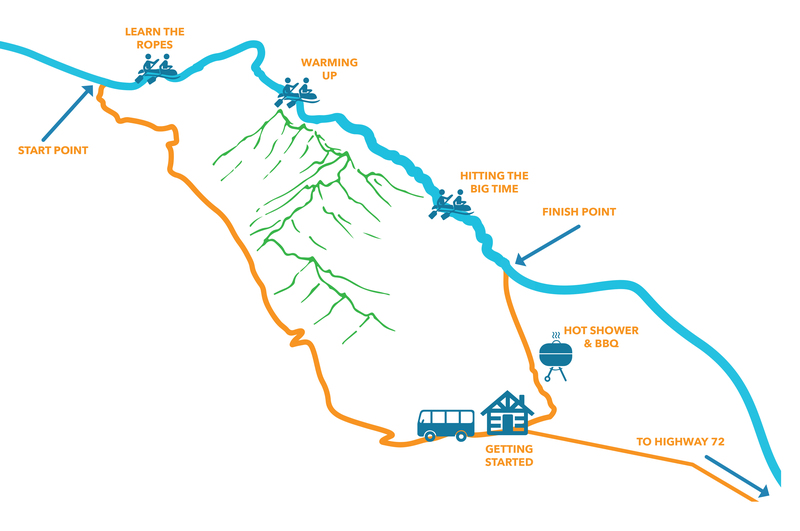 Before we hit the big time, we’ll start running a series of fun grade 2 and 3 rapids, so you can get a real feel for what to expect at the Rangitata Gorge. Before you drop into the big ones of grade 5 Gorge section, you’ll get the chance to jump out of the boat and have a look at what’s to come. If it looks a bit too much, you can walk around the Gorge with our photographer. Otherwise, you’ll jump back in the boat and raft down the wild canyon. Preview the complete circuit of the grade 5 experience.